The FF-680W is the perfect solution, with the ability to scan photographs on both sides in one scan. 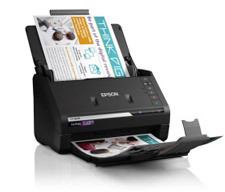 Epson has eliminated the difficulties associated scanning photo’s on a flatbed scanner. It can be so tedious, and many other scanners can’t handle stacks of photos in varying sizes. The FF-680W does this with ease, and also includes software that brings new life to old photos, as well as let you to share these images easily via social media. The Epson FastFoto FF-680W offers a host of powerful tools for photo restoration. Bring new life to old photos with auto enhancement, color restoration, red-eye reduction, de-skew, crop, and rotate. The scanner can capture full details in both highlight and shadow, delivering exceptionally clear and highly detailed scans. In addition, users can easily edit documents and save time with automatic file naming, plus powerful productivity tools. With built-in Nuance® OmniPage Optical Character Recognition (OCR), users can create searchable PDFs, plus editable Word and Excel®files.